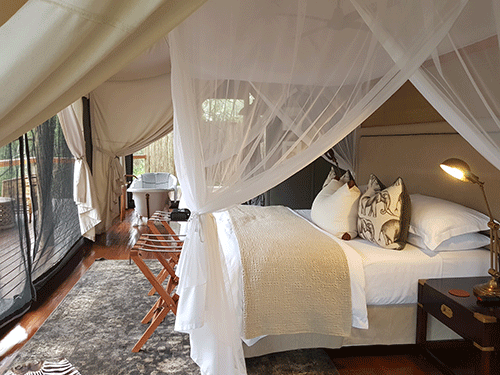 Situated in the 23 000ha Manyoni (meaning place of many birds in isiZulu) Private Game Reserve, Rhino Sands Safari Camp is the newest addition to the lodge offerings available at Manyoni and can only accommodate 8 guests at a time in four luxury tents, ensuring exclusivity and personal attention. The camp prides itself on being the only Green Camp within the Reserve and runs entirely off-grid on solar energy and borehole water. The Reception come Main Lodge area is tastefully decorated with a nod to a bygone era with modern touches which successfully creates a warm welcoming atmosphere laced with class. The deck overlooks the dry Msunduzi River with Riverine Woodland with the luxury tents strategically placed along raised wooden platforms so you feel completely separate from other guests and immersed in nature. No detail has been spared in the design and decor and the tents are thoughtfully laid out. You are provided with two game drives daily, one early morning, the other late afternoon/evening. Both drives include drinks stops which allows you to stretch the legs and take in the beauty that is Manyoni Private Game Reserve. Your Field Ranger is extremely passionate about the Bush, and, has the knowledge to back it up which makes for an exciting and interesting few hours. After the game drives you head back to Camp for a delicious brunch or decadent 3-course dinner prepared by the in-house Chef, who knows exactly how to satisfy even the fussiest foodie. 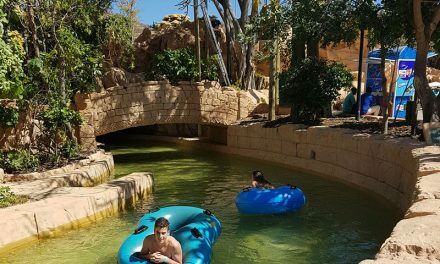 Rhino Sands Safari Camp is the type of place you would spend a special occasion, perfect for celebrating your Honeymoon, Birthday, Anniversary or Babymoon. It truly is a very special, incredibly beautiful Camp and one for the Bucket List.